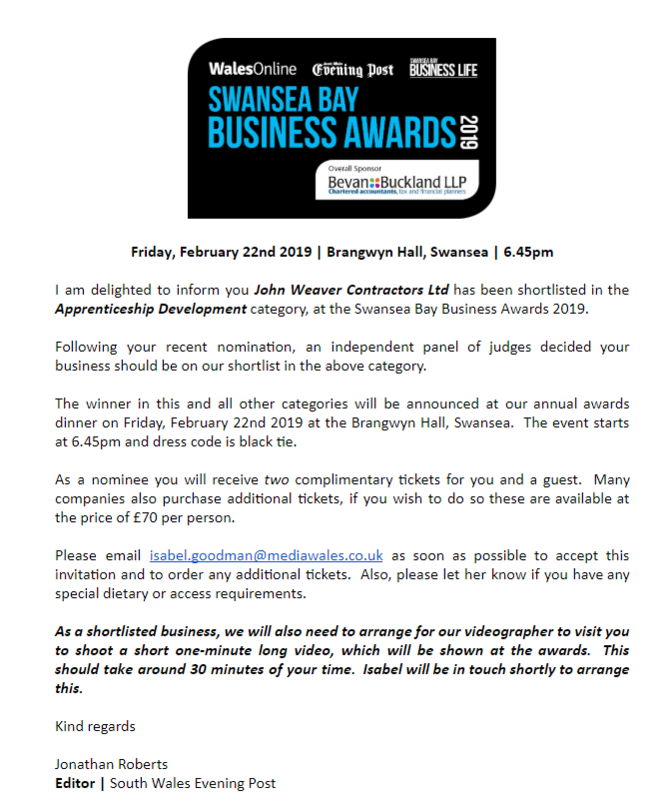 We are delighted to announce John Weaver Contractors have been shortlisted for the Apprenticeship Development Award at the Swansea Bay Business Awards. The winner will be announced at this years ceremony at the Brangwyn Hall in February. JWC recognise that the Company’s direct workforce including apprentices is fundamental to the continued success of the organisation and the industry as a whole. The Company decided to put particular focus and activity into making it one of our top aims and give opportunities for young people and the local community to have an apprenticeship with us and a long term career path, whilst being fully supported, mentored and coached by our very experienced workforce and management team. This also forms part of our Sustainablity Policy, Company Mission Statement and TRT focus. Joan Tamlyn, Business Development Manager said, "It's fantastic to be nominated for this award, and recognised as an employer who invests in young people and apprentices offering training with can be hard to find nowadays within construction. We look forward to attending the awards in February and thank you for the recognition".